Today marked the end of the Alaska Highway in Delta Junction, about 1400 miles since I started on it in Dawson Creek, BC. This was a satisfying accomplishment. 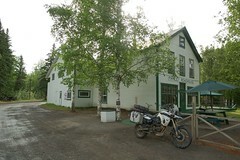 From Delta Junction, I continued on the Richardson Highway to Fairbanks and stopped at Adventure Cycleworks. This is a great local family business. I carried my spare tires with me and changed them myself, but for everyone less stubborn than me, these are the guys to talk to. You can order your tires through them and when you arrive they’ll swap them out for you. They’re also a great resource for tips on riding in Alaska, including trips up the Dalton Highway. I also met CJ from CJ Designs here with a couple friends from Wisconsin. I would run into them a couple more times as they were headed up the Dalton to Deadhorse as well. When I left Adventure Cycleworks it was early afternoon. It felt too late to go too far up the Dalton, so I decided to ride the entire Elliott Highway out to Manley Hot Springs. What a great choice! Once past the intersection with the Dalton, the Elliott Highway is mostly dirt road for eighty miles along ridge-top. Stunning views that I couldn’t capture with a camera and a really fun road to ride. Manley was my kind of town. The hot springs are on private property but the owner has them open to the public, however I didn’t visit. Like a lot of Alaska, folks get around on their ATVs rather than driving. The town sits on a river, and has a decent sized grass and dirt airport. I spent most of my time at the roadhouse where I rented a room for the night, listening to to the locals. After dinner at the bar I set out to swap out of my road tires into my Continental TKC80 knobby tires that I had brought along with me. I hadn’t change tires on this bike before, but I had on others. 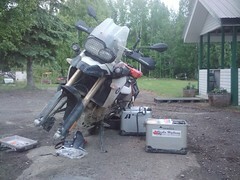 I was stubbornly confident that it was doable and brought along a full travel set of tools, including puncture kit, BestRest pump, tire levers and spare tubes. The first challenge is balancing the bike to remove the wheels. The rear wheel is easy to remove using the bikes center stand. I highly recommend having a center stand, it makes other maintenance easier as well, like lubing the chain. The F800GS is balanced forward when on the center stand, so removing the front wheel requires leaning it over carefully, or finding a something to strap the rear end down to. Done again I might back the bike up to a porch or something and use one of my Rok Straps to cinch down the rear. For starters, I used a tool to remove the valve stems from the tube. This ensured I wasn’t fighting against any lingering air in the tire that I couldn’t push out due to the rigidity of the tire. Breaking the bead, which is the tire edge that sticks to the rim, is the hardest part. For the rear wheel, you can put the bike up on the center stand, and then use the side stand with the weight of the bike pulled down on the tire to do this. For the front wheel, I just used my knees, working around the tire until I was successful. There’s nothing fun about this. The worst I had to deal with was mosquitoes, but doing it in the rain or blistering sun would be painful. Getting the tires off requires at least a couple tire levers, some muscle work, and patience. The F800GS has tube-type tires, so you don’t need any special equipment or tricks to bead the new tires. With smaller tubeless tires you can wrap a ratchet strap around the tire and tighten to seal the bead while you put air into the tire. Automotive tubeless tires usually require a machine or dangerous use of flammable gases to seat the bead. Success was eventually had, with some perseverance. I spent the rest of the evening listening to the local young men talk about working on the North Slope. I was interesting to compare stories of the truckers I had heard some different sources. Some made them out to be speeding dangers who were paid by the trip and only cared about getting to the other end of the highway. Others were more respectful and noted that most of the companies up there had vehicle speed governors on their trucks. I’ll include some specific notes as relevant later on, but for the most part I’m sure reality is somewhere in between all of the stories. After a beer, I headed off upstairs to my first night in a real bed on the trip. This entry was posted in Uncategorized on June 18, 2011 by btm.